American Service Paws store, 4TheDogs.com, now offers Show-Me Animal Products from Vocational Services, Inc. a not-for-profit corporation that provides employment and training opportunities for nearly 200 individuals with disabilities. Sport Dog Kit including gunshot wound card for hunting, law enforcement K9, field trial, and other outdoor canine activities. Barn First Aid Kit Wall mountable metal cabinet including vet card and equine emergency supplies. Foaling Kit with essential items for horse owner when foal is on the way. Vet Kit for horse emergencies. Western Trail Kit with western saddle bag with first aid items in case of emergency while out on the trail. English Trail Kit including English belt bag with first aid items in case of emergency while out on the trail. Natural Special Kits are also available which includes Well-Horse or Well-Pet. Well-Horse is organic, non-toxic, and will not burn live or injured skin. It regenerates tissue on wounds by promoting formation of new collagen while killing fungal and bacterial micro agents on contact. Well-Horse works fast on Scratches, Dew poisoning, Rain rot, Poison Oak, Poison Ivy, and more. Well-Pet , a 600 year old formula of blended resins using ingredients from the Amazon Rainforest. Well-Pet is used for its amazing healing properties on skin fungus and open wounds. It helps to regenerate skin, kill bacteria on contact and doesn’t burn injured tissue. Some of the natural equine kits also include Thrush-Off, which kills thrush on contact. VSI began Show-Me Animal Products in 1993 in order to expand and ensure opportunities as traditional jobs were increasingly lost to international competition.One of VSI’s most unique programs, WPS has been studied regionally and even nationally for its unique expansion of opportunities for people with developmental disabilities. VSI developed WPS to provide more intense supervision, motivation, and assistance to these individuals as a means of increasing their work skills. This allows them to retain their options for employment. The techniques used include everything from community service to skill-training and other efforts. Many WPS participants have been able to increase their skill levels by two, three, or even four times, allowing them to retain their workshop choice. 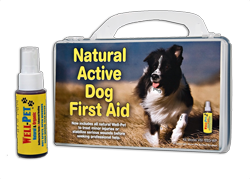 VSI Executive Director Randy Hylton said the positive reception awarded Pet Kit™ at major product shows and by the public has been gratifying. "We worked very hard to design a quality product that would meet the needs of pet owners," he said. "But it's also gratifying that the work of our employees have been so well received. That's very exciting."